The side-hustle is getting a lot of grief these days. Having a side-gig is getting blamed for everything from millennial burn-out to the accusation that we’re turning our hobbies into jobs because of online/offline peer pressure (and thus hating our hobbies for being our jobs). And while it’s true the entrepreneurial mood right now is focused on eradicating the toxic “always be hustling” culture we were taught to adore in the first fifteen years of this awful new century, the fact is, gigs and hustles and multiple hats are part of our culture and our economy now. Let’s be real: we live in a very disappointing simulation most of the time. Ah, 2019: wage stagnation, financial inequality, and an expectation that if we need anything in an emergency, or even the very basics of healthcare, a for-profit corporation will handle it… providing your job still fits into their latest business plan. We should be so lucky as to have a passion we can monetize, if that’s our society’s status quo. So don’t hate the gig economy, hate the game — then learn to play it well. Start off by knowing thy enemy: it’s not the work. The root cause of both burn-out and of hating your passion-turned-job is a lack of balance, not simply the monetization of hobbies. Here’s the thing: there is nothing more important than work-life balance. While it’s really common to get burn-out just from working your nine-to-five, it’s also true that side-hustles, even the ones you are passionate about, can easily upend whatever tenuous grasp you might have had on work-life balance–especially when they’re added to a nine-to-five day. When I was working a full-time job and writing fiction and freelancing and trying to ride just a couple of days per week, my life was a series of precariously balanced appointments, with meticulously monitored commute times to make it all possible. I had to give up freelancing, but even that wasn’t enough. I barely had the energy to write anything after work, I didn’t have time to work out so I could feel healthy and good about myself, and getting to the barn was an exercise in resilience and not going crazy in traffic jams. I don’t know if keeping to that strict timetable was work-life balance or a slowly soul-numbing descent into hell, but either way, once my full-time job was over, I realized I didn’t have to clock-watch in order to get to the things I loved. So I turned back to my passions and sorted out what parts of them I could monetize (or in some cases, hyper-monetize) and found actual control over my day. It is my day, after all. Of course, there’s work to be done at balancing all of my side-hustles, turning my work day into one big succession of hustles. At first I asked: can I write for a certain website I enjoy writing for and produce a novel in 90 days and pick up a freelance social media campaign and plan travel and teach riding lessons and have a family life? It turns out that no, I can’t. I’ve been back in the hustle life for less than two months and I’ve already had to make some adjustments to my expectations of myself. I had to do some calculations, figure out the ROI on the work I was doing, and choose to prioritize the work paying the highest ROI and eliminate the work paying the lowest. As a result, I’ve now completed the first draft of a novel in record time (six weeks, thank you for asking! ), booked some very cool vacations for some very cool people, started teaching riding lessons so we can rock a new generation of horsey kids, started working out (I can run three miles now without stopping, thank you for asking! ), and spend what is probably too much time with my family, no seriously, I think they are tired of me. And what I love most? This can change. I can change this up tomorrow. I could add a freelance gig, pick up a part-time job so that I can remember how to interact with other humans, jump on a contract and work in an office for a few months making something cool happen, write another book, write a series of short stories, start a podcast (okay that probably won’t make any money) — but the point is, my life is mix-and-match right now, and I’m running around the candy shop, picking my favorite flavors. Let your hobby earn you some breathing room. Let your passions run your life. Let your side-hustles give you new meaning. Just keep it balanced. You can do this. The Internet gives us the opportunity to market ourselves with almost no effort. Want to sell your dressage-themed cross-stitch pillows, but don’t have time to market them? Start an Instagram and a Facebook, and spend an hour on Saturday evening scheduling posts for the week while you’re ignoring Netflix. (You’re on your phone anyway.) Tag some horsey influencers and ask if you can mail them a couple. There, you did some marketing for the week. No craft shows, no tack shop cold calls, no fuss. Now you can get back to ignoring Netflix in peace. The gig economy is here and we can let it empower us, or we can let it burn us out. What we can’t do is deny it exists, and that it’s taking over our lives. How are you going to hustle it? PS: if you’re marketing dressage cross-stitch pillows, I want to see them. And if you’re making something awesome – contact me! I’m going to start a monthly feature on equestrians with side-hustles! I spent a good half of March away from home. It might be the longest I’ve ever been away, and I was very sorry to leave behind my amazing mattress and pillow with the prospect of many different hotel and Airbnb beds in my future. From London to Manchester to Belfast to all-over-Ireland and back again, it was a combo business/pleasure trip, and you know how hard those are to pack for. I schlepped my favorite black skirt all over hill and dale, and never even wore it. Sheep and sky near Molls Gap, on the Ring of Kerry. I saw some incredible places in Ireland (Killarney National Park blew my mind, as did the lonely southern end of the Cliffs of Moher, which we trekked up to via a muddy farm lane, rather than heading for the more well-traveled north end and its visitor’s center). Eventually, I’ll even get my pictures off the camera and then I’ll share some. In the meantime, if you’ve been thinking of going to Ireland… do it. Jogging with Maggie through Killarney National Park, on our way to Ross Castle. The great thing about vacation is once I’ve had a few days of no work, I get incredibly pumped up to get back to work and do all the things. Not just work — working out, eating right, getting enough sleep, everything. I’d be sitting in a pub drinking Guinness and eating a pile of local mussels and a loaf of brown bread and thinking, when I get home I’m going to drink less beer, eat less bread, work out, write my novel… basically everything the opposite of a vacation! Ben showing off his summer coat… he was totally transformed from shaggy pony to sleek small horse while I was away! So I’ve been back in Florida since Sunday (today’s Friday) and I’ve ridden Ben three times for an hour–very long for us–plus pulled his ridiculously shaggy pony mane, I’ve downloaded a couch-to-5K app and actually gone running, I’ve eaten all kinds of fruits and vegetables (I did have ice cream once this week though), I’ve gotten up early to write before heading off to Office Job, and finally today I prepared Chapters 2 and 3 of Horses in Wonderland for Patreon and uploaded them. Which, by the way, I really hope you’ll give a read and leave a comment. I’m reading the second half of Pride to see where I actually left Grace, Kennedy and Company. But a lot of you have read Show Barn Blues and Pride far more recently than I have, so if you notice any inconsistencies, or if you know of any plot lines you’d like for me to pick up again, please drop a note in for me. That’s one advantage of uploading first drafts to Patreon rather than writing in my usual cozy vacuum. The Patreon model is really helpful because basically, Patrons contribute a few bucks to me and it covers the time I would usually spend working on freelance work, allowing me to work on novels instead. In return, I share the first draft as its written and also send Patrons a digital copy (and paperback, depending on the contribution level) of the novel once its complete. I actually gave up my last freelance client so I could concentrate on my novels because the demand from readers is so great, but I do have to make up that income. Plus, I think it’s an exciting way to share the writing process. And it takes me way out of my comfort zone, sharing and asking for feedback on the first draft. Like guys, I just don’t do that. You have no idea how private I am with my writing. 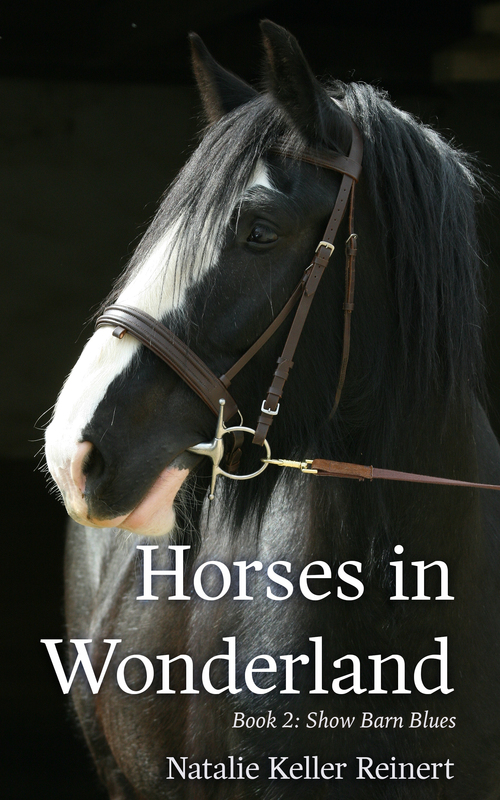 So anyway, Chapter 1 of Horses in Wonderland, the sequel to Show Barn Blues (and I guess, in a way, to Pride), is free to read, and you can decide from there if you’d like to read more. Click here to give it a look! Also, my other work in progress, You Must Be This Tall, is on Patreon. This is a novel about the crazy world of theme park fandom, with a collection of brand new characters you’ve never met before… unless you happen to be a theme park fan, and then you’ve definitely met them! Give it a go here. Before I sign off, I just want to say thank you to the readers who have given Luck 40 great reviews on Amazon. Whether you loved it more than any of the others, or you had some constructive criticism – noted!! – your reviews keep Luck visible, and that’s how it finds new readers. If you haven’t reviewed Luck, it just takes a few moments, so won’t you pop over and say what you think? Thanks everyone for keeping equestrian fiction going! What’s everyone reading right now? Drop a comment with your recommendations! OH, one more thing. This song I’m sharing below is getting serious repeat play in my earbuds right now. It’s a very dreamy synthpop ballad, so if you’re not sure if our musical tastes match up, I promise it isn’t going to assault your ears! Look for it on a writing playlist after Horses in Wonderland. I might be writing about another Ocala couple you like next. Plus, if you’re interested in my previous writing playlists, click here for the Spotify playlist I made while writing Courage. I just wanted to give a quick shout-out to the readers who have taken a few minutes (or more than a few minutes, judging by the length and detail of some of these things) to leave reviews for Show Barn Blues. You are so, so appreciated. I don’t even have the words. Okay, the last one wasn’t particularly nice but I just want to be up-front with the criticisms as well as the raves. There are also stars and reviews on GoodReads, whose users I have always found to be a very tough crowd, so the scattering of 5-star ratings there is deeply appreciated. All I can say, again, is thank you, and I’ll keep writing to bring you a new book as soon as possible. I couldn’t write these books if it wasn’t for you, and your reviews are what connect new readers to my books. Writing books takes time, having time to write takes money, yet books make very little money. It’s a conundrum writers have been facing for as long as we’ve been putting stories on paper. When you leave a review and convince people to try my books for the first time, you’re giving me a few extra minutes to work on Pride, or whatever new title is in production. I should also let you know that the paperback of Show Barn Blues is now available from Amazon, Barnes & Noble, and CreateSpace, and it’s absolutely beautiful. So if you prefer a book you can touch and put on your bookshelf and admire, pick up a copy! If you think your local tack shop should be carrying my books, get in touch with their contact information and I’ll reach out to them. And if you haven’t joined us at Horseback Reads, please make sure to like our Facebook page and keep in touch on Twitter! We’re going to have more equestrian writing and content to keep you up to date on the latest horse books from our authors. If you’re looking for new authors to try, Horseback Reads is the place to start. That’s all for now… I better get writing! I really, really need a good writing habit. This summer has not been my best for writing. As I blogged the other day, I’ve been working slightly insane hours, and when I’m not at work, I would really rather go to the pool/go to a theme park/go to sleep/do anything besides think about what the characters inhabiting the recesses of my brain are up to. I would prefer they stay in the recesses of my brain until I have more energy to deal with them. The Internet is great for finding enabling quotes like this one. See, Anne Tyler is bad at writing habits, too! I’m really, really good at panicking. Somehow this summer I managed to finish Show Barn Blues, and the consequential lift in mood and energy that comes from publishing a book at last, from not having to open that damn file anymore, from having fresh new words to look at, is pushing me to really make a commitment to my writing. I need to do better. I need to do more. I need to finish Pride. So, I’m trying to get myself back into the writing habit by opening up my computer and editing a chapter of Pride every morning. But then Bradbury comes and lays down a truth-bomb. Obviously this is not as easy as my current morning routine, which is plopping onto the couch and looking at Twitter for an hour. And, in what is probably a surprising twist only to me, it’s actually more entertaining than looking at Twitter for an hour. I don’t even know what I’m looking at on Twitter most of the time. Theme park news, random pictures of racehorses steaming in the morning sunlight, a funny gif of a dog… seriously, what have I been doing with my life? It’s more entertaining, writing a novel, but it requires infinitely more effort than the couch/Twitter combo, and sometimes most of the time I just don’t feel like I have the energy or the brain power to write anything of consequence. Well, if the past two days are any indication, I actually do have both the energy and the brain power, so I have to keep at this morning writing challenge until it stops being a challenge and starts being a habit. Of course, next week, I work at 8 AM every day, so I’m not sure how this is all going to hold up when I’m leaving the house at 7:30. Do I have any energy and/or brain power at six in the morning? I have to tell you, the outlook is not promising. The Internet is overrun with motivational blog posts informing me of illustrious writers who set their alarms for 4 AM every morning and write ten thousand words before breakfast, but maybe those illustrious writers are morning people with an extraordinary sense of vision and purpose who also don’t have Twitter? What about the rest of us? Keep your commitment small to avoid anxiety that fuels resistance. I’m very talented at anxiety. It’s easier to honor your commitment early in the day, before your decision-making capacity is depleted. Do what you say will do as soon as you can; that way, you can enjoy the satisfaction and self-respect for the rest of the day. That feeling of satisfaction and self-respect goes a long way, especially if I encounter a person later in the day who would like to make me feel like I am less than important. Excuse me, rude person, I wrote part of a novel this morning. What did you do? Move along. Give yourself a small reward when you honor your commitment. At the very least, acknowledge and celebrate the fact that you are honoring the commitment. I’m going to reward myself with an egg sandwich. It’s very simple positive reinforcement: you write, you get breakfast. Good job, Natalie.